Finally backyard farmers who want to keep a few hens for eggs have a bible that's attractive enough to leave out on the coffee table, and inexpensive enough to purchase on a whim. This comprehensive guide, written in charming prose from the perspective of an organic farmer, will appeal to readers who are interested in raising chickens, or simply want the best knowledge about how to cook them. With this in mind, farmer and animal expert Jennifer Megyesi discusses all the basic details of raising the birds general biology, health, food, choosing breeds, and so on and she cuts through the smoke to identify what terms like "organic," "free-range," and so on really mean for poultry farmers and consumers. No chicken book would be complete without information on how to show chickens for prizes, and this is no different, but The Joy of Keeping Chickens also stresses the importance of self-sustainability and organic living, and the satisfaction of keeping heirloom breeds. 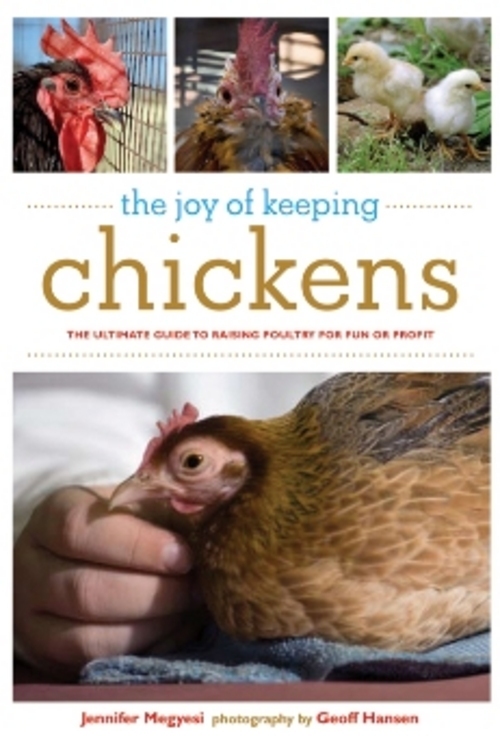 Readers will appreciate the comprehensive nature of this readable, informative guide, and Megyesi's enthusiasm about keeping chickens. Coupled with Geoff Hansen's gorgeous full-color photographs, this text makes for an instant classic in the category. Jennifer Megyesi own and run the Fat Rooster Farm in Vermont. She holds a master's degree in wildlife biology and has worked for the U.S. Fish and Wildlife Service. Her farm is currently breeding Cuckoo Marans chickens, famed for laying chocolate-colored eggs. She lives on the farm with her husband and son in Royalton, Vermont. Geoff Hansen is a photographer and editor at the Valley News in Lebanon, New Hampshire. He has published in Newsweek, USA Today, and The New York Times. He lives in Tunbridge, Vermont, with his wife, daughter, and two beagles. Size: 6 x 9 x 0.7 in.